Click the fish to submit the form. Our 10 foot locking HDMI High Speed cable features a simple slide lock mechanism to secure your connections and prevent accidental disconnection. The HDMI cable is the newest and best digital video connection on the market. HDMI is the only cable that can transfer uncompressed high-definition video and multi channel digital audio in resolutions up to 4K (Ultra HD). HDMI cables are convenient because they will allow the transfer of digital audio and video in a single cable, permitting a less confusing mess of wires and a cleaner entertainment center. The HDMI connector is small, which makes it ideal for installers and in-wall use. 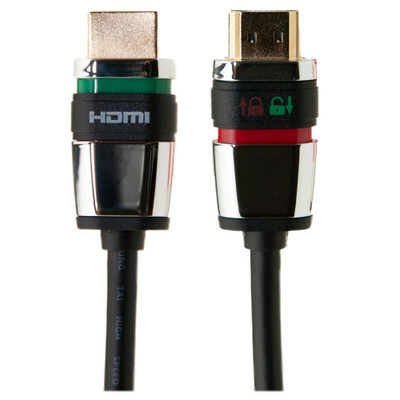 HDMI cables can be used with any device with HDMI such as HDTVs, DVD players, Blu-ray players, game consoles (PS3, Xbox 360), cable and satellite set top boxes, DVRs, computers, etc.